Every Friday afternoon from 2:30 p.m.-3:30 p.m., a group of about 15 students get together in Johns Hall for an end-of-the-week chat. Some are politics and international affairs majors. Others are majoring in math or music. Some weeks, they’ve talked about Shakespeare. Some weeks, it has been Cicero. A major focus of the club this semester has been the Odyssey. No matter the topic, students leave feeling refreshed and challenged to think differently. Adam Thomas ’10 co-founded Furman’s Political Thought Club as an undergraduate political science major and Duke Scholar. 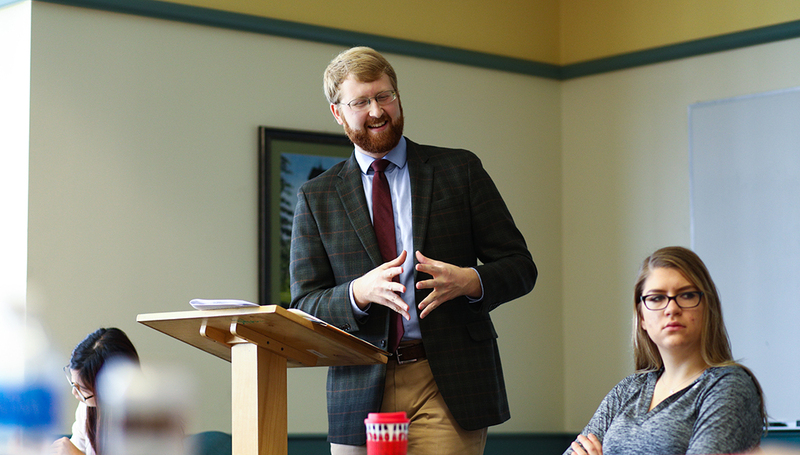 These days, you can still find him helping to facilitate discussions with club members in his role as the Thomas W. Smith Postdoctoral Fellow in Western and American Political Thought. Thomas, who is teaching two courses in political thought this fall, said it was his experience as a Furman student that shaped his career plans and future. His study away course in the British Isles and Western Europe with Politics and International Affairs Professors Don Aiesi and Brent Nelsen marked his first time out of the country. By the end of the trip, he had started thinking about the world differently—taking in new perspectives on history, religion and philosophy. High impact learning experiences like study away are part of Furman’s promise to every student through The Furman Advantage. 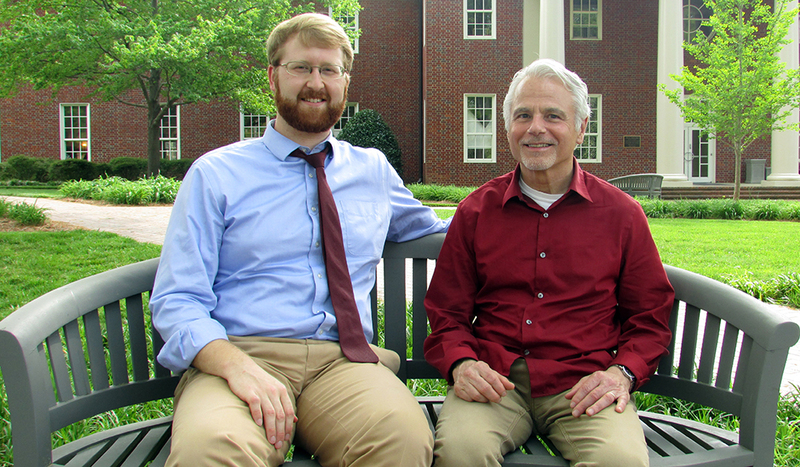 When Thomas returned to Furman to resume his undergraduate studies, a course with Politics and International Affairs Professor Benjamin Storey introduced him to many of the great political philosophers. Thomas, who then had plans to become an attorney, was hooked. Little did he realize he would be teaching the class himself a decade later. During his first year at Furman, Thomas both taught classes and helped Politics and International Affairs Professor Ty Tessitore run The Tocqueville Program. Since returning to his alma mater, Thomas is still reminding himself that it’s OK to call his colleagues by their first names. Adam Thomas and Politics and International Affairs Professor Ty Tessitore. Tessitore recalls that as a student, Thomas never dominated a discussion in class. Rather, Thomas made comments in a way that invited other students to comment and be part of discussions. It’s a sterling quality Thomas has kept as he’s developed his art of teaching. “Some people are natural teachers. He is one of them,” said Tessitore, who has been serving as one of Thomas’ mentors. Carol Lewis ’18, a mathematics major from Greer, took American Political Thought with Thomas last year. She said she appreciated how Thomas is not only approachable but genuinely cares about what students think. For Thomas, the transition to teaching has been exciting and enjoyable. Learn more about The Tocqueville Lecture series and view a full schedule of this year’s events. Last updated October 11, 2017 .